Bandhan Bank MD & CEO CS Ghosh (left) handing over the cheque to Swapna Barman. On the extreme right is her coach Subhas Sarkar. 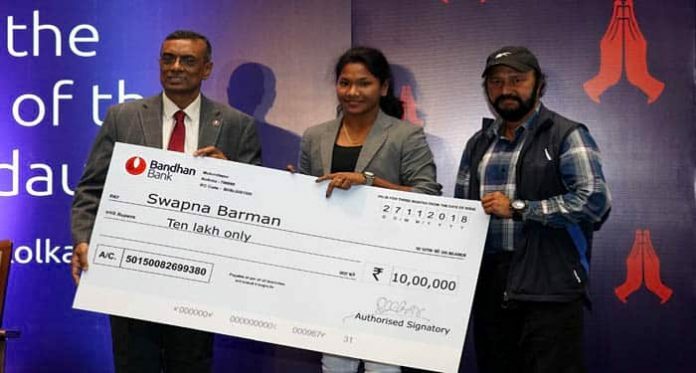 Kolkata: The city-headquartered Bandhan Bank today awarded a reward of Rs 10-lakh to Bengal’s golden girl Swapna Barman for being the first Indian to win gold in heptathlon at the Asian Games in August. Bandhan Bank founder MD and CEO, Chandra Shekhar Ghosh, handed over the award in the form of a cheque to Barman at a felicitation event in the city today. Earlier the Bengal government had rewarded the athlete with Rs 10-lakh and the Centre gave her Rs 30-lakh towards future training. Twenty-two year old Barman, whose journey onto becoming a heptathlon champion no less than a fairy-tale for she belongs to an impoverished family from northern Bengal, said that her immediate focus is to win a medal in an Asian championship due next year and then to secure an entry into the 2020 Summer Olympics in Tokyo. 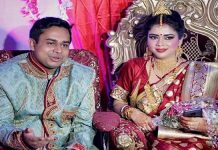 Ghosh said that right from the days when Bandhan was solely an NGO to now being a pan-India bank, it has always believed in the empowerment of the underprivileged section, especially women.